We are now living in the era where everyone is playing the 'religion card' to gain the supremacy. Some feel that the believer of their own religion or faith is in the condition of extreme danger and there needs to be the revival. For them, they can go any extreme to be under the political umbrella to protect their faith and to save their community from the verge of being disappeared in the minority or vice versa. Religion in life can sometimes go to such an extreme that can lead to the path of violence. Well, we forget that ‘one's gain cannot be another’s’ pain’ and there always a way for peaceful coexistence and respect each other faith or belief rather than to take a path of extremism or fundamentalism to be precise. The book ‘Why I am a Hindu’ by Dr. Shashi Tharoor has provided a beautiful analysis of Hindu Religion, the faith of majority Indian people, (although several parts of the world have Hinduism) the word Hindu is related to India. and the first thing people of other parts of the world is to relate Hinduism to India. The Hinduism began in the Indian subcontinent and spread other parts of the world through the migrants and immigrants. The first gradual spread occured towards east to what is now contemporary Southeast Asia. Ancient Hindu cultures thrived as far as Cambodia, Thailand, the Philippines, Vietnam, and Indonesia. Some of the architectural works (including the famous Angkor Wat temple in Cambodia) still remain as vestiges of Hindu contact. Remembering my time in Indonesia in Central Java, when I interacted with some of the Indonesian students they refer us as ‘Hindu’ people, not ‘Indian’ people. The popular things one can hear that ‘Cow is a God in India’. The perceptions they have for us is somewhat rudimentary. We are secular and we respect every religion within our own self-defined tolerances limits. Like, we have our own distinct food habit and culture according to our belief but that doesn’t mean we impose our faith or belief on someone else. Coming to the book, it has been divided into three parts and each part has quite well described the concept of the title ‘Why I am a Hindu’. To start with the first part itself starts with the origin of the ‘Hindu’ and the Hindu customs that usually the typical Hindu people usually follow. Here he draws facts from our age-old texts of Rig Veda and Upanishads. Hinduism is a philosophy as it doesn’t impose people the certain rules and norms, to prove him of Hindu faith. Hinduism is open to acceptance. Hinduism is all about tolerance and not about supremacy to other religion or denounces others’ belief or faith. There are also the descriptions of Puranic story, the origin of the iconography of Gods. Hindu deities, themselves symbolizes the power, courage, valor, acceptance of all sects, or people belonging to different strata of society. The stories and mythologies are either description of a scientific factor or the then social structural setup and focus on several factors like gender equality or animal loving. The first part of the book in its third chapter addressed the issues of so-called self-proclaimed ‘babas’ or ‘mataji’s’ and he sarcastically describe the incidents related to such ‘babas’, it shows the main problem of Indian society to fall trap of these gurus, which have nothing to do with ‘Hindu’. In this section there is also mention of the caste system, as caste is still one of the critical issues of the country, which only had originated for occupational division or hierarchy, now has become the part and parcel of everyday lives. There lies severe discrimination against the people belongs to a lower class. In the end, the book also covers some great personalities and their perspective on Hinduism, like Ramanuja and Bhakti movement, Mirabai, Raja Rammohan Roy, Swami Vivekananda, Mahatma Gandhi among many others. 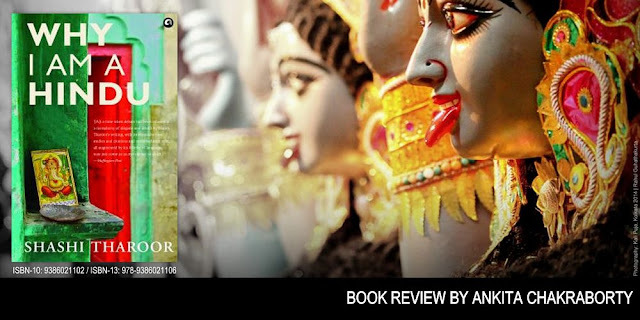 The second part of the book is about the ‘Hindutva’ or about playing the ‘Religion card’ in politics, which is already mentioned in the first part of the article. India is a secular country and the playing of religion card is somewhat a distraction from the main problems of the country which fellow countrymen are suffering. At the same time, the fundamentalism or the distortion of social fabric in the name of Hindutva is not at all acceptable, as mentioned, Hinduism doesn’t mean destruction or annihilation, it is 'open to accept'. This part has also dealt with the theory of the origin of Hindus and the ‘Aryan Invasion Theory’, mentioning the debates relating to it through other scholarly articles. This part of the book is also relatively important in the present scenario as it handled some critical issues of religious bigotry and the 'beef politics'. Last part of the book is very relaxing as it provides the image of culture and religious pluralism. I practically witness the culture part during my stay in Central Java, where the majority of the Muslim population dwells and ‘Ramayana’ or ‘Mahabharata’ are the epics read in every household, and they know the stories more than any Indian people who claim themselves as ‘Hindu’ or promoting ‘Hindutva’ or fundamentalism. The book mentions the Sanskrit name of the Javanese people. The Javanese Muslim people keep their names as Sita, Arjuna, and Rama etc. They do not see the epics as 'Hindu' epics but as epics for all and by all, which all of them read since childhood. The underlying philosophy is much clear, Hinduism is the most tolerant and open to acceptance and it is not to be confused with some narrow-minded ideas incorporated in the society for personal gains. Ankita Chakraborty (TR RID: G-9047-2016 / ORCID: 0000-0001-8420-5940) is a Research Scholar at Department of Political Sciences, Vidyasagar University, India.